When Leor Pantilat’s FKT for the Evolution “loop” came up in my news feed, I skimmed it and moved on, having other things on my mind. However, on the way back from Forsyth, I had some time to think about it while dealing with trail miles. On paper, 55 miles with 10k vertical in 12h15 looks soft; Yours Truly ran 50 miles with 12k vertical in about 9 hours at San Juan Solstice, and the winner was about an hour faster. But was it actually soft, or was it a slow course? I have often felt (or at least told people) that I should test my end-of-season shape with an actual trail run. 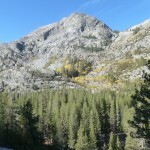 A final few free days in the Sierra would give me that chance. The answer turns out to be somewhere in between: The course is slower than the stats (55 miles, 10k vertical) would suggest, thanks to sections of basically unrunnable trail around Muir and Bishop Passes. However, having a good day and pushing myself about as hard as I could without blowing up at the end, I was able to pull off a 10h31. I think someone else could knock another hour off this time, but not me. While better nutrition might have helped me a bit, I felt more limited by muscular fatigue and joint pain. 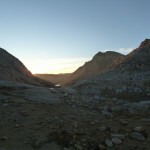 I woke up before my alarm in the hiker parking area at North Lake and, after eating breakfast and dithering around, left for the trailhead at 5:45. Noticing that the air was unexpectedly warm, I wore only a windbreaker over a cotton t-shirt, my warm hat, and a pair of socks on my hands (I could only find one glove in the chaos of my car/home). 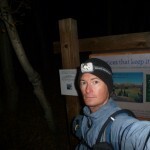 I reached the sign at 5:55, took the clock-starting picture, and started up the trail by headlamp. I expected my legs to feel rusty after two days’ rest, but I was soon jogging the gradual uphills, and felt that this would be a good day. 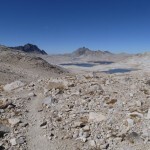 I reached the pass in the long dawn, noting that my split was about even with the FKT, then dropped through Humphreys Basin. 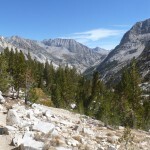 The first part of the trail was every bit as pleasant as I remembered from previous outings. 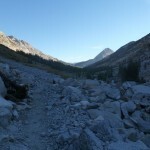 The unfamiliar trail through the woods was also quite runnable, though the drunken trail crew from the Dorothy Pass PCT seems to have added some loopy switchbacks here as well. Since I was playing by “ultra rules,” I dutifully followed them. 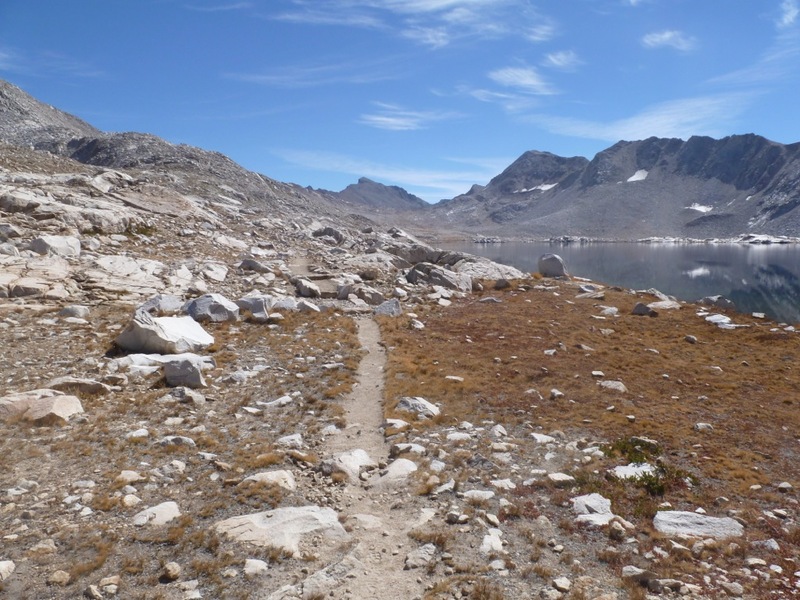 The downhill stretch from Piute Pass to the JMT seemed to go on forever and, as I ran out of mountains in front of me, I began to wonder if I had missed a turn, and would suddenly find myself at some west-side trailhead. 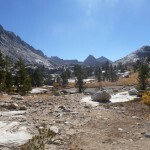 This last worry was not so far off: when I finally reached the JMT, I also reached the edge of the (west-side) Sierra National Forest, and saw a sign pointing to Florence Lake. The last part of the descent had some rockier trail, but most of this long descent was fast and fun. 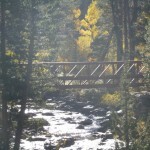 Turning up toward Goddard Canyon, the very runnable trail passed through turning aspens along a broad, rushing creek. This was one of the most enjoyable sections of the trail, and I was sorry to leave it at the Goddard Canyon fork, turning into the woods and switchbacking up to the hanging mouth of the Evolution Valley. I mostly fast-walked the switchbacks, jogging the longer and flatter stretches, then jogged on through the woods to the stream crossing. After a couple minutes’ search, I found the narrow logs people had been using to cross, grabbed a couple of stubby sticks, and sort-of “deer danced” my way across. After more flat, runnable wooded trail, I hiked another section of switchbacks (probably) near the Darwin Bench cut-off, then gradually emerged from the trees near the first big lake. This section, from Evolution Lakes to Wanda Lake, was one of the best of the loop, and I jogged most of the gradual climb, stopping occasionally to take pictures of the familiar but still spectacular scenery. 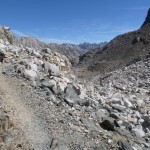 The trail became more annoying above Wanda Lake, with more scree and bits of the horrible rubble-box construction. After hours of running, I began to feel my digestive system falling behind my input of pop-tarts and energy bars, and my eating slowed. Reaching the hut, I took a short break to take some pictures and get out my two gels. This seemed like a good time for 200 easily-digestible calories. From the pass to near Big Pete Meadow, the trail crosses more moraine, and though I ran most of it, my “run” was not that much faster than a walk. After some easier running, the trail once again became tricky on the switchbacks into Le Conte Canyon, from which I could see the long drop I faced before the final climb to Bishop Pass. After the initial, steep descent, the trail along the canyon is mostly runnable, though longer than I had expected, since I initially misidentified the slabby side-valley leading to Dusy Basin. 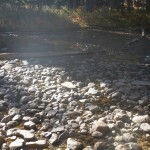 I stopped along the way to refill my water for the last time, grabbing about 2 liters. Finally reaching the Dusy Basin turn-off, I noted that the sign said it was 6 miles to the pass, and I estimated that I had no more than 3 hours left in the day. As long as I didn’t bonk, I had a very good shot at a sub-11-hour time. This helped motivate me on the climb, somewhat making up for my increasing difficulty eating — though I was baking on the west-facing slope, I managed to jog short flatter sections of the switchbacks. Topping out at the bottom of Dusy Basin, I met a couple who asked where I was coming from. When I told them, they said they had met another person doing the loop in the other direction only a couple of days earlier. I tried to remain upbeat climbing the basin, but my digestive situation was threatening to slow me down. 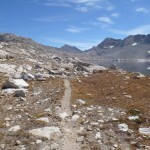 Stopping to dig a hole, I made some more room, and was able to slowly eat most of an energy bar on the long slog to Bishop Pass. 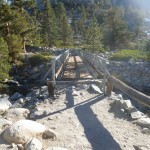 Most of the trail from Le Conte Canyon to Bishop Pass has been too damaged by packers (both their animals and their attempts at trail-work) to be usefully runnable in either direction. I was happy with my split at the pass, then almost immediately pained by the truly wretched trail down the other side to the first lake. While I wasn’t flying after that, I had enough left in my quads to descend at a respectable rate. I passed a few fisher-folk on the way to the sign, took the “stop” picture, walked around for a minute to see if my legs would cramp, then lay down in the dirt. Based on the splits, it looks like I was running the downhills somewhat faster, and Pantilat “positive-split” the course, usually a suboptimal pacing strategy. Electrolytes? Yes. Turbolytes? Powerlytes? No. More lytes than my body had room for? Unfortunately, yes, and I had to correct the “input-output flux imbalance” in, um… Dusy Basin. Disgusted by the fact that gels (glorified Karo syrup) are down to 83 cal/$, I only bought two, instead relying on my usual mix of pop-tarts and energy bars. This proved adequate but suboptimal, as there wasn’t enough low-intensity time for my digestive system to take care of them, and I ate less than I brought. I mostly used my usual hiking setup, but ditched a few things from my pack (sunscreen, bug spray), and wore light tights instead of nylon pants. 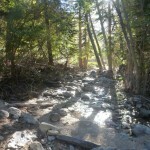 I wore my light trail runners (the sadly-discontinued New Balance 101s) instead of the heavier ones I wear hiking. They provided adequate foot protection, albeit barely. 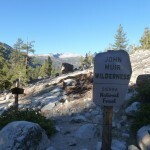 This entry was posted in California, FKT, Type II fun, Ultra. Bookmark the permalink. Thanks! While I prefer more scrambling/technical stuff, I like to try out a run like this from time to time. Good Job! You have been crushing this year! Wish you to stay healthy and continue pushing your limits! Thanks, it has been a good season! You’ve been up to some serious stuff yourself. Maybe you can rope-gun for me sometime. 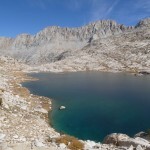 Sean, are there female records for this route or say the rae lakes loop? Where does one find fkt’s for peaks and are they gender distinguished? There are normally separate male and female FKTs, but I don’t know of one for Evolution Loop. 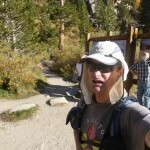 I didn’t see one on the FKT board, but someone local, e.g. at Sage to Summit, might know. I know of only one speed attempt on the CA 14ers by a woman. 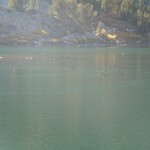 In July 2006 Jacqueline Florine climbed the legal 14ers in 9d12h17m. Man you’re FAST! Your write-up brings back a lot of memories. 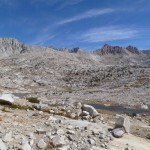 I did that loop solo last August in a tad under 24 hrs. Not too bad for a 55 yr old!? I tried to travel as light as possible and get some sleeep in Muir Hut but I nearly froze to death in that stone coffin! I’ll be back this summer to try and do it faster. BTW one of my best buddies is Jack McBroom, he says congrats on the 14’ers record! 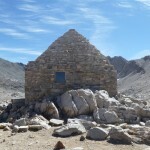 Sleeping in Muir Hut sounds miserable — I guess you’re out of the wind, but it’s one of the highest points on the loop. I would much rather keep moving, however slowly and painfully, just to stay warm. Tell Jack thanks. I hope he’s still out there getting after it.